i'm so excited for spring! spring is such a great time of year, with all the beautiful flowers blooming and color entering back into the world. i always get a tad depressed come winter because everything dies and turns all gray. i love color.. and when color goes away a little piece of me goes with it. spring is like my heart waking up again! another reason i love spring is because it ushers in summer. i love summer. more than spring. i'm looking forward to summer break with my son after his first year of school. i can't wait to spend all day everyday with him! no school to dictate our routine, just having fun swimming, camping, beaching...but lets not get ahead of ourselves. back to spring. 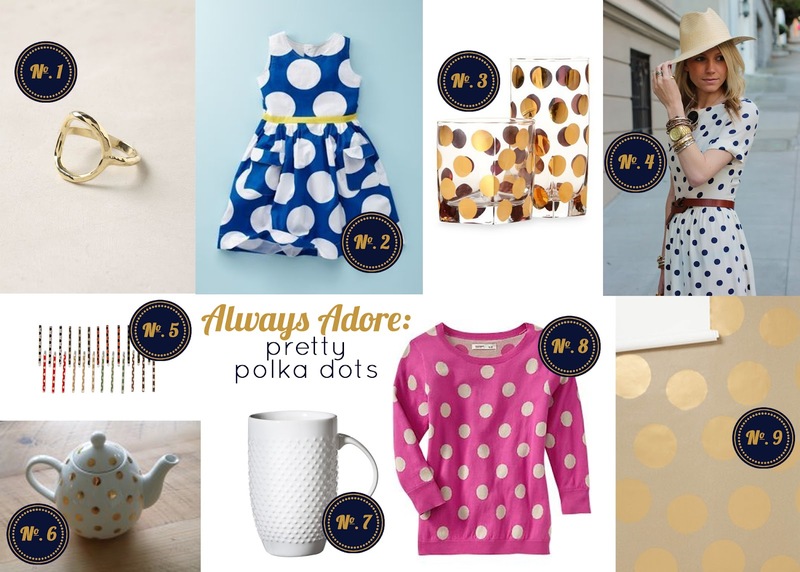 i know i should be posting an inspiration board about all the ways you can decorate an egg for Easter, or my favorite floral prints - and maybe i will later - but honestly, right now, i'm LOVING polka dots. here are a few that are inspiring me now. No.1} i know this isn't EXACTLY a polka dot pattern, but its circular and fabulous. get it on my finger. No.2} this dress is adorable for little a. it would be a great Easter dress, and i would love one for myself... twinners? No.3} classy and fun tumblers, right here. No.4} orrrrrr.... i could wear THIS for Easter. or everyday. even when i'm sleeping. mkay. No.5} these little bobby pins are perfect for growing out bangs. No.6} if the idea of scalding my mouth weren't an issue, i would drink tea straight from this tea pot. that's how much i love it. No.7} i have this mug and i drink all liquids from it. all day. it's heavy, feels wonderful texturally in my hand, and makes my eyes happy. i should probably have more than one. No.8} how am i living without this sweater? No.9} i'd love to see this wallpaper in my bedroom, or wrap myself in it like a blanket. ok. so i'm seeing a lot of gold. and i'm feeling a little weird about it because i can vividly remember the day (back in the late 80's early 90's) when white gold was all the rage and i decided as a young girl NEVER to love gold. and it's creeping in on me. why do i want it in my house? where i can see it all day? because i like it now. maybe love. not sure. what about you, do you prefer silver to gold or vise versa? i hope you have a great first day of spring!